P.O. BOX 268 802 MARKET ST.
CHOCKS -- FAIRLEADS -- ETC. 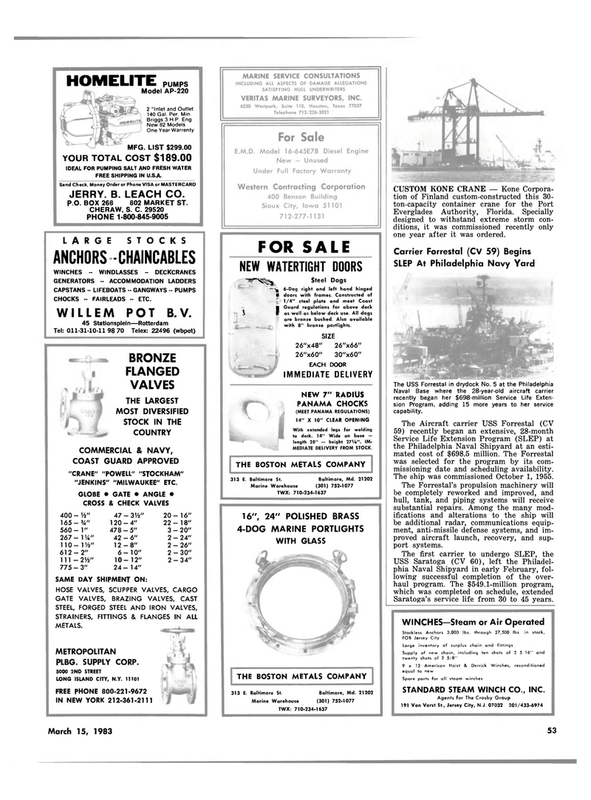 COAST GUARD APPROVED "CRANE" "POWELL" "STOCKHAM" "JENKINS" "MILWAUKEE" ETC. CROSS & CHECK VALVES 400 - Va" 47 - 3Vfc" 20-16" 165-%" 120-4" 22-18" 560- 1" 478-5" 3-20" 267 - 1 VA" 42 - 6" 2 - 24" 110 - 1 W 12-8" 2 - 26" 612-2" 6-10" 2-30" 111 — 2V2" 10-12" 2-34" 775-3" 24-14"
NEW WATERTIGHT DOORS "WSSfii Steel Dogs ' t 6-Dog right and left hand hinged 1 doors with frames. Constructed of 1/4" steel plate and meet Coast || Guard regulations for above deck ! as well as below deck use. All dogs are bronze bushed. Also available with 8" bronze portlights. Everglades Authority, Florida. Specially designed to withstand extreme storm con- ditions, it was commissioned recently only one year after it was ordered. Naval Base where the 28-year-old aircraft carrier recently began her $698-million Service Life Exten- sion Program, adding 15 more years to her service capability. Service Life Extension Program (SLEP) at the Philadelphia Naval Shipyard at an esti- mated cost of $698.5 million. The Forrestal was selected for the program by its com- missioning date and scheduling availability. The Forrestal's propulsion machinery will be completely reworked and improved, and hull, tank, and piping systems will receive substantial repairs. Among the many mod- ifications and alterations to the ship will be additional radar, communications equip- ment, anti-missile defense systems, and im- proved aircraft launch, recovery, and sup- port systems. Saratoga's service life from 30 to 45 years. STANDARD STEAM WINCH CO., INC.